Help Desk software as a service is attractive to many IT departments. It offers the same benefits of traditional IT help desk solutions, in addition to reducing capital expenses, accelerating implementation, and providing easier upgrades. 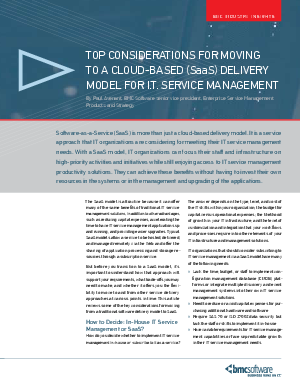 Paul Avenant from BMC Software gives his top considerations for moving to a cloud-based (SaaS) delivery model for I.T. Service Management exploring implementing in-house or as a service.